During our Discovery in Action sessions the issue of power and influence often emerges during discussions. This can be in the context of leading staff, managing up or influencing and leading peers and stakeholders inside or outside the organisation. An interesting question we sometimes explore, especially when people feel they don’t have a great deal of power, is: Where does your power come from? This often elicits a deeper understanding of how you can become more influential by drawing on a range of ‘power bases’ that don’t necessarily derive from organisational position or authority. 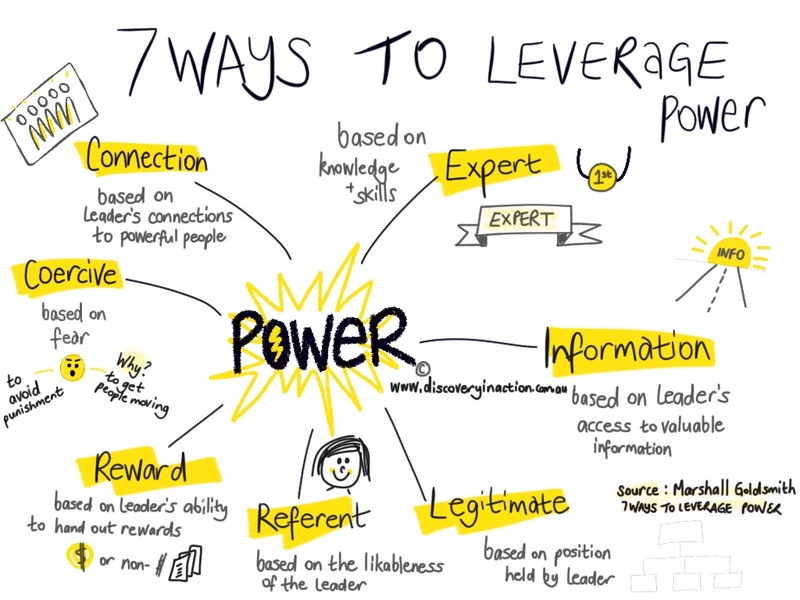 We have captured these in this simple info-visual – 7 ways to leverage power. Know your stuff. Invest in being highly knowledgeable and skilled in the topics around which you are wanting to influence. In an organisational setting it could be about making regular presentations, running training sessions, writing internal blogs or pieces for the organisational newsletter. Or you could do these things on a broader stage if your are seeking to influence outside your organisation. Build networks and get to know people. Take the time to actively develop relationships with people you want to influence. Be friendly, have coffee catch-ups, get to know their issues and business, be helpful, follow through on promises, build trust. Again, like most things, its not rocket science, however consistent attention and discipline over time will provide you with the leverage from these power bases that helps you to be influential.